The Jing'an Temple, the most famous landmark in Jing'an District, is known as the oldest shrine in the city, dating back even further than the city itself. Constructed in 247 AD, it boasts a history of 1,757 years, meaning it was built more than 1,000 years before the official beginning of the city of Shanghai in 1292. 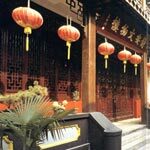 Originally located beside Suzhou Creek, it was relocated to its current site in 1216 during the Song Dynasty (960-1279 AD). In 1912, the country's first Buddhism organization was established at the site. During the Cultural Revolution, the temple was converted into a plastics factory. It was converted back to a temple following reconstruction in 1983. Unlike its name, which means "peace and tranquility" in Chinese, the small, garishly decorated temple is always crowded and lively. It is hardly a place for quiet meditation these days. Located on bustling Nanjing Road W., which was once known as Jing'an Temple Road, the place is surrounded by towering office buildings and luxurious shopping centers. The metro line station is within a stone's throw. Thanks to the unique location, visitors can expect to find curious foreign tourists and fashion icons carrying shopping bags along with pious Buddhists, mostly local old women, at the holy site. The temple is currently undergoing the second phase of a major renovation, which involves an area of more than 17,000 square meters. The renovation, which is expected to cost 40 million yuan (US$4.82 million), will be financed from the temple's funds, as well as donations from Buddhists from home and abroad. During the first phase of the renovation, two 12.8-meter tall buildings were constructed on both sides of the temple's main gate at a cost of about 6 million yuan. One of the structures is being used to hang the 3.3-meter Peace Bell, which was cast in 1999 to signify the advent of the 21st century. The other holds a drum, which is 2.2 meters in diameter and made of cow skin. An underground fountain is also being built inside one of the buildings. The design for the temple strictly adheres to the style of traditional Chinese Buddhist temples. The Precious Hall of the Great Hero, or the main hall, is currently under construction. When completed, it is expected to be four to five stories tall. The wooden architecture will be an example of the typical Song Dynasty style. One of the best antiquities in the temple is a Ming Dynasty (1368-1644) copper bell, known as the Hongwu Bell, which weighs about 3.5 tons. It is now housed on the second-floor base of the main hall. To the east of the main hall is the Guanyin Hall, a place for people to pay tribute to the Goddess of Mercy. The rare female Buddha is one of the most universally beloved deities in Buddhism. In the center of the hall is a statue of the goddess made out of camphor wood. Standing on a lotus-shaped base, it is about 6.2 meters tall and weights about 5 tons. Opposite to the hall is the Jade Buddha Hall, where a 3.8-meter jade Buddha sits in the center. It is also the largest sitting jade Buddha in the country. Address: No.1686, Nanjing Road W.